Is this the world's fastest motorbike? Some say it is so, and with an alleged world speed record under its belt, they could be right. Powered by two J402-CA-702 Model 373 turbine engines – more commonly found in US military cruise missiles – the superbike recently broke the 200mph barrier. If unconfirmed reports claiming it took 7.887 seconds to do so prove correct, it will indeed be the world's fastest motorcycle. Did we mention it's powered by missile engines? 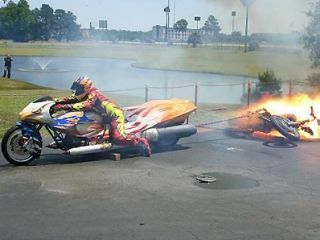 Check out the video for the bike in all its fiery glory. In other news, you could be able to buy your first flying car from 2011. According to reports, flight testing of the initial "proof of concept" Terrafugia Transition "roadable aeroplane" has been successful, with the first customer deliveries being touted for 2011. Also this week: the US military have been tweeting to counter the Taliban. The unusual move is all part of a news communications effort to reach readers who receive their information online rather than in newspapers, and will see officials in Afghanistan launching a Facebook page and YouTube site as well. Elsewhere, not satisfied with machines that can merely make copies of themselves, the US military tech bureau DARPA has launched a programme to develop robots able to participate in their own construction – while they're still being built. Expect horror stories of machines multiplying out of control, plus death and widespread destruction. And the world's largest laser is finally open for business. Housed in a 10-story building "as wide as three football fields", the $3.5 billion National Ignition Facility will aim 192 laser beams at a 2mm ball of frozen hydrogen gas to achieve nuclear fusion. You'll have to wait until 2040 to find out if it works though. The rather fetching goggles below are, in fact, an instrument. Yes that's right: constructed from the modified guts of a Pikachu doll, it's controlled by an external box that lets you adjust the pitch and sample section. We can't say the music is particularly pleasing to the ear, but the guy trying to play it looks pretty funny. Out with the old, in with the new: if you're bored with you everyday, regular touchscreen keyboard, may we suggest the Crocodile Keyboard concept? Triangle keys are apparently the way forward for the more fat-fingered among us – at least according to inventor David Baker, who's patented the idea. A mother has been reunited with her son after her sister saw him on social networking site Facebook – 27 years after she claims he was kidnapped. Despite being given custody after her marriage to a Hungarian man broke down, Avril Grube, 62, lost contact with her son when his father broke his visitation rights and took him to Hungary 27 years ago. Gavin Paros met his mother this week, after his aunt typed his name into Facebook and found his profile, the BBC reported.